It is still available in most countries, but no longer sold in the U.S. due to its mercury content. In 7th grade (1962-63) we played with Mercury and it had no effect on me. From Wikipedia: "Hazards: Toxic, dangerous for the environment." Between this and our ubiquitous "mercury fillings" how ever did we survive??? And as kids we we just couldn't understand the logic used by our parents. Ah the dreaded Mercurochrome. If anything other antiseptic worked, Mom had no clue about it. Always slapped the red stuff on the cuts. 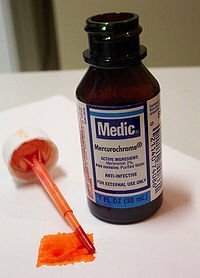 I will never forget my mother using a whole bottle of this on me when our family dog (a dachshund) bit me to the bone on both knees. I was sure glad when my mom statred using Mercurichrome instead of iodine, which burned like crazy. This probably saved quite a few kids from death at one time. No one understood the power of staph infections yet. I hated this stuff growing up.